Shahadat is a sacred word. The martyrs are equally highly respected to all people. Any person, regardless of Muslim, non-Muslim, race, religion or caste, is affected by the feeling of special passion on Shahadat or Shaheed words. The most beloved thing among the people is their life. It is not easy to give up on life for nothing. That is why the person sacrificing his life for the sake of something thing, without doubt, that purpose is very great, very high and acceptable to all. That is why the martyrdom is the highest level of sacrifice. Shaheed Fazle Elahi is also a life, a motivation, a jihadi declaration, a conviction, a revolution. 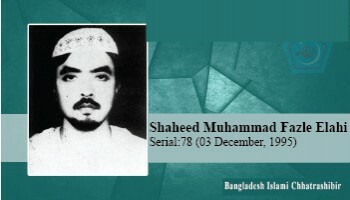 "Among the most notable memories of my 12-year active organizational life, the memory of the martyrdom of Shahid Fazle Elahi is the most memorable among all. In 1995, the political crisis related to the issue of anti government caretaker government also spread in Laksmipur. Shibir also played a big role in that movement. According to the plan to destroy Shibir, on 3 December 1995, the Shibir zila office was attacked by a big rally. Brave 20/30 Shibir activists faced the attacks with infinite courage in the office. In a short moment, the incident spread to Laxmipur town. Fazle Elahi, who was at the office, was a source of motivation for Shibir activists. At one stage of fierce clashes, Fazle Elahi fell into the ground due to hockey stick and sharp knife injuries. Some Shibir activists took Fazle Elahi to the Sadar Hospital to save his life through treatment. But the same brutality was faced there, and the hospital was attacked. In a fierce bomb explosion, 7/8 more were wounded and injured in an unprecedented scale of vandalism. Fazle Elahi was also injured for a second time. The doctor declared Fazle Elahi dead as he was being transferred to a car for the transfer to Dhaka, and he was martyred in this manner. My son always said, do not worry for me, pray that I may be martyred.